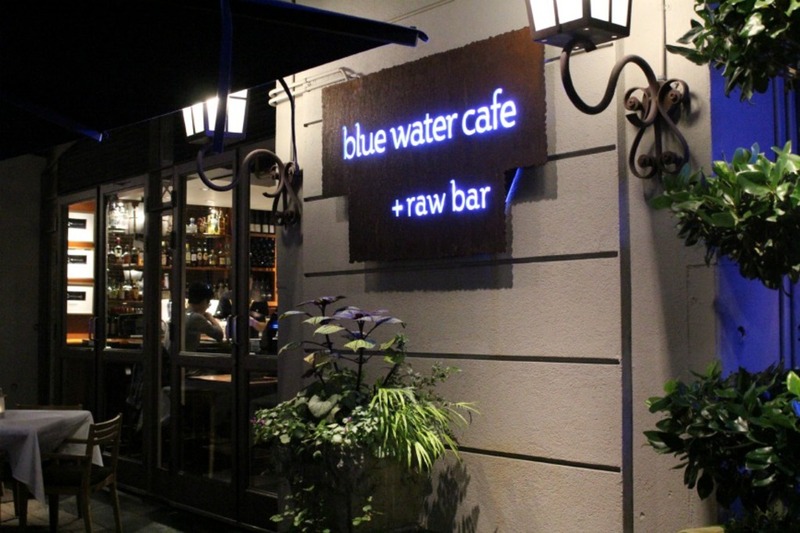 So here’s the story of me and Blue Water Cafe. Ever since I knew of Blue Water Cafe 4 years ago, I’ve always wanted to come here. However, living a student lifestyle at the time did not allow for me to blow $70-100 on a meal so I resisted long and hard until I got my first full time career position. So fast forward to today. I brought Meta Knight here for his birthday because he enjoyed it the first time he came here with his family during Dine Out (yes, Blue Water used to participate in the Dine Out program!). When I arrived, I was the little girl who couldn’t wait to go into the candy store. 4 years of anticipation and expectation led me to this day where I will have the freshest, most amazing seafood ever. Right when we came through the door. Two waitresses looked at us and smiled…. and said nothing. No, “Hi, welcome to Blue Water Cafe Do you have a reservation?” or “Hi, how are you doing today?”. The just kept that awkward smile until I had to say, “Uh.. I’m have a reservation under _____ at 7pm”. Already not off to a good start. 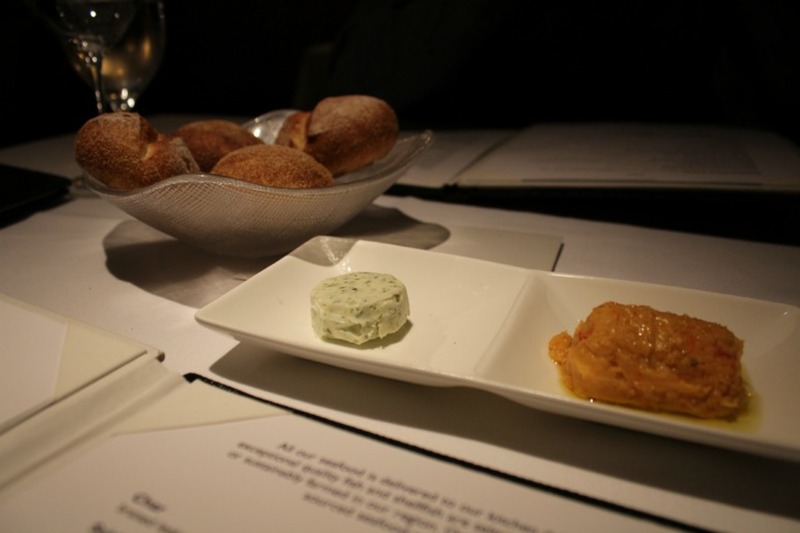 Meta Knight and I thought the bread was pretty great though and the seaweed butter was sublime. I could eat that butter day and night. 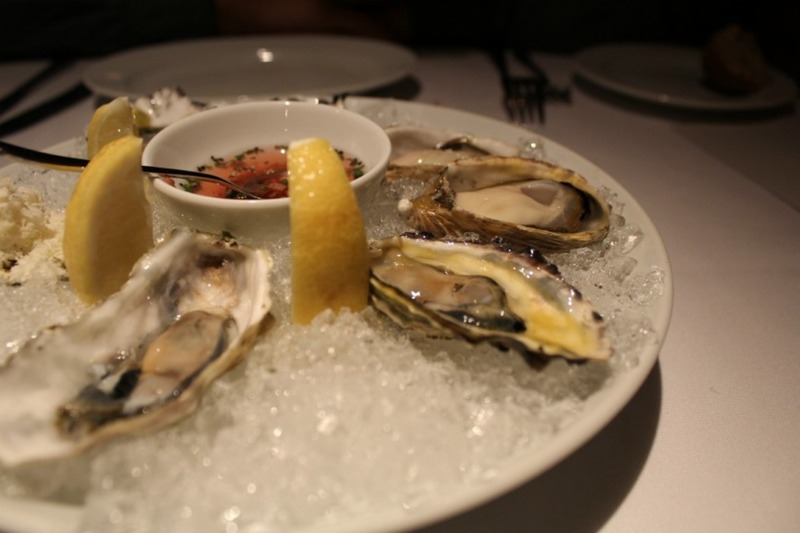 We started off with half a dozen of Assorted Fresh Oysters and we both agreed that Kusshi ($3.50/pc) was the best. They have a deeper cup and is milder in taste. Very refreshing. 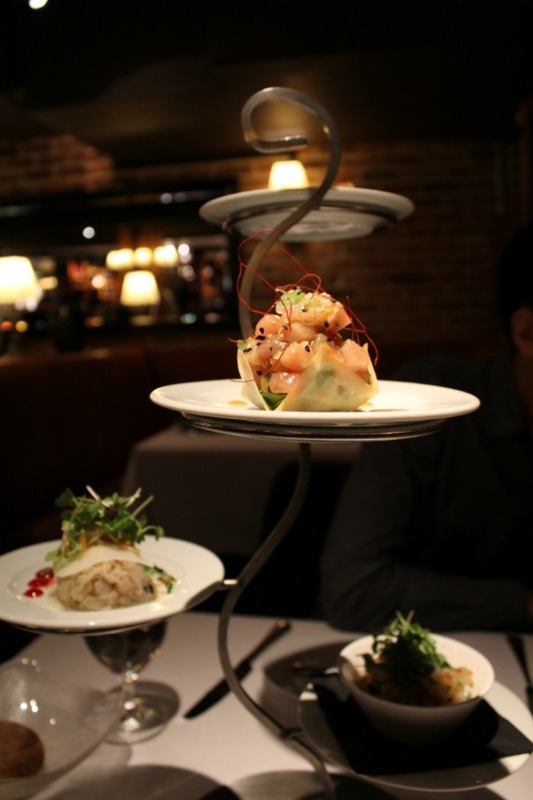 The BC Tasting For Two ($17.50/person) looked very appealing so we also ordered this for our appy. It arrived in a majestic presentation which surprised us both. 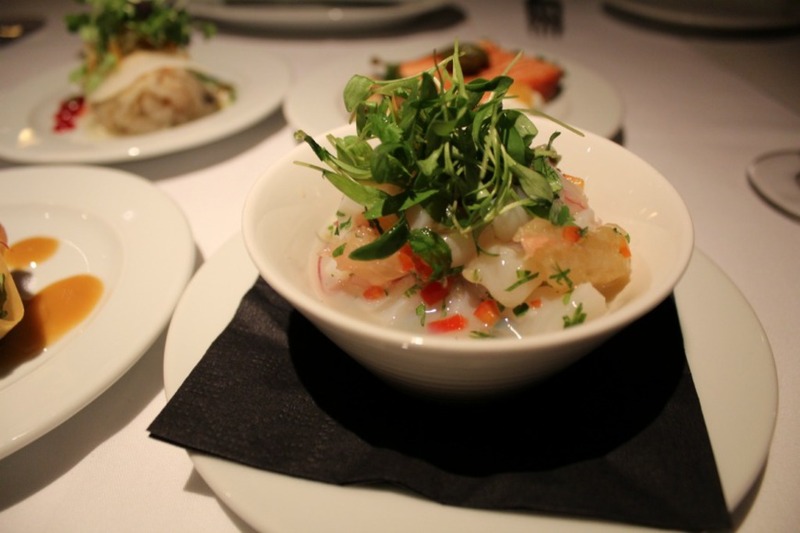 First up was the Scallop Ceviche. We both thought this was pretty bland and oddly mediocre despite our overwhelming love of scallops. 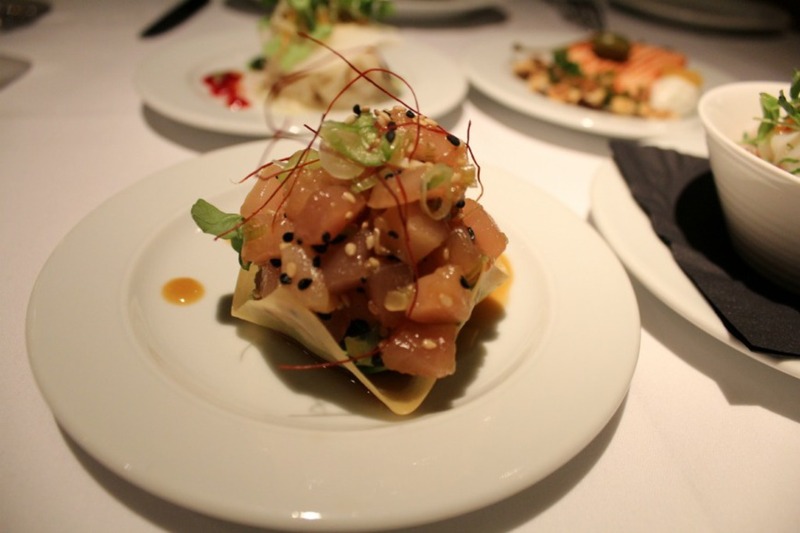 The Albacore Tuna Tartare was awesome and deliciously dressed in an asian marinade. The crispy wonton wrapper was also really light and delicious. 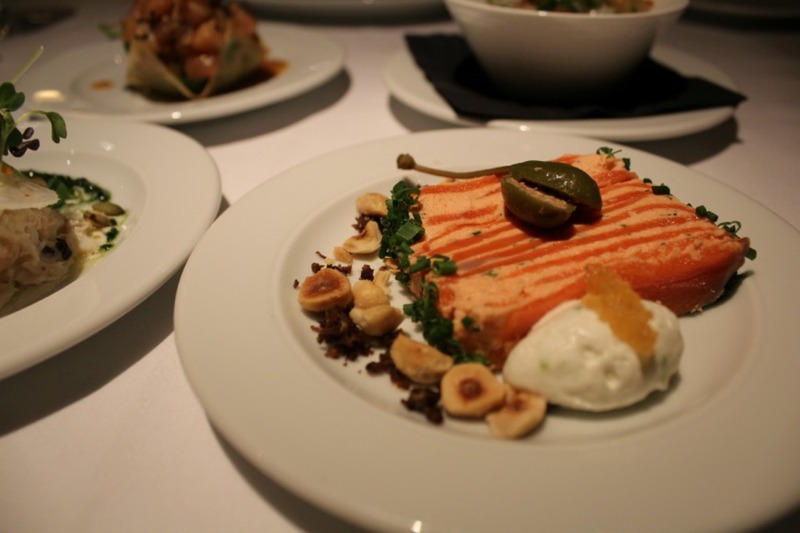 Another winner was the Smoked Sockeye Salmon Terrine. I love smoked salmon so this preparation of it blew me away. 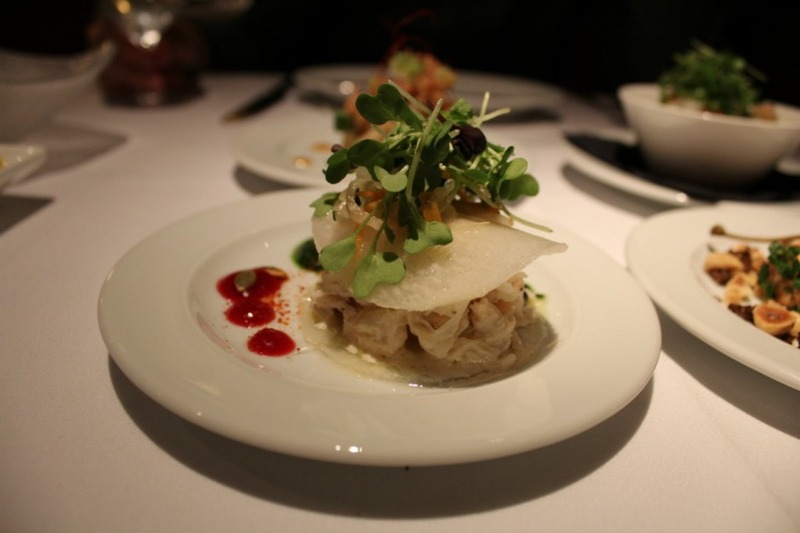 What the Dungeness Crab Salad lacks in colour, it makes up for in taste. Incredibly fresh tasting, and refreshing on the palate. I knew four years ago that the entree I would order when I ever get a chance to go to Blue Water Cafe, is the Qualicum Bay Scallops ($33.50). 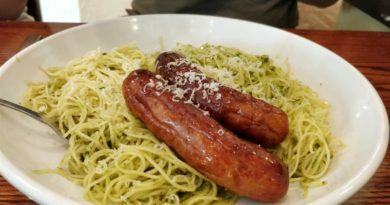 I’ve read a ridiculous amount of reviews all claiming this to be the most amazing dish so needless to say my expectation was very high. The price point also made me think this dish would be in the big leagues. While my scallops were perfectly cooked. I received two and a half of them. Not even three. 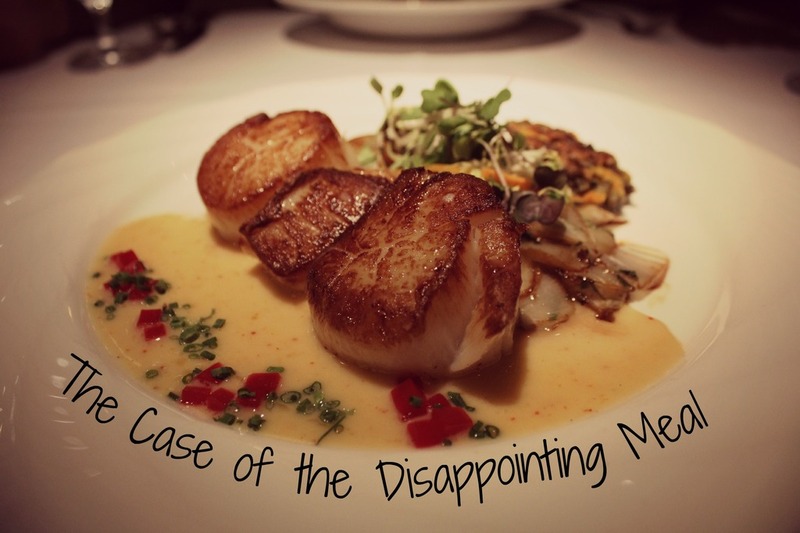 The pictures I’ve seen of this dish always had 3-5 full scallops on it so I was disappointed already. Next, the wild rice griddle cake was bland and tough. Third, the sauce was oddly sweet and tasted more like dessert. Lastly, the carmelized onions tasted rotten and had a horrible aftertaste. Having left most of my dish untouched, my server didn’t ask me if anything was wrong. When I pointed out that the onions tasted really really odd and bitter (like it was rotten), he said, oh its the kind of onion, its suppose to taste like that. And just left it at that. 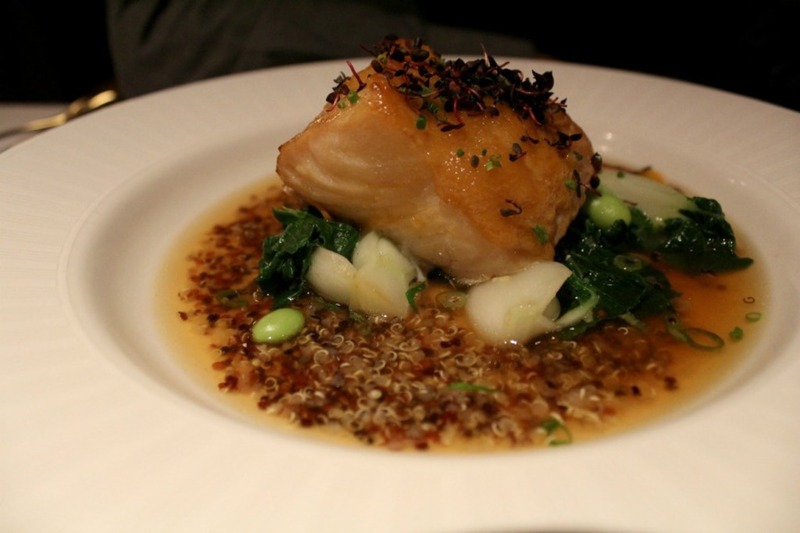 On the other hand, Meta Knight had the most amazing Sablefish ($37.50) we’ve ever tasted. The broth was to die for and the fish was so buttery and soft, you could chew it without any teeth. If I ever (decide to) come back I am so getting this. I was beyond frustrated and ever so disappointed at this point that I almost didn’t want dessert. 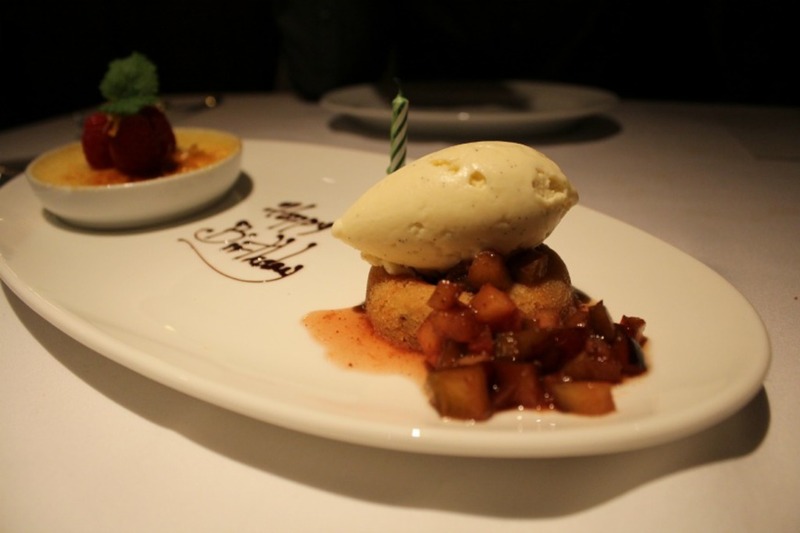 However, it was Meta Knight’s birthday and we wanted to see if they could redeem themselves so we ordered a dessert. They were nice enough to personalize it and wish him a happy birthday. The dessert overall was good. Then again it was a tasting menu.